Men are better at navigating than women, according to a massive study, but there's not much for men to be proud about. Scientists at University College London say the difference has more to do with discrimination and unequal opportunities than any innate ability. The findings come from research into a test for dementia. But it has also given an unprecedented insight into people's navigational ability all around the world. The experiment is actually a computer game, Sea Hero Quest, that has had more than four million players. 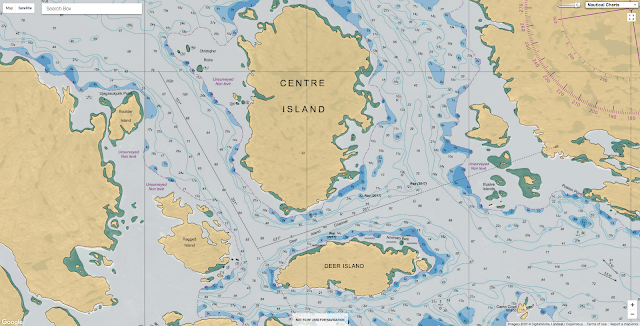 It's a nautical adventure to save an old sailor's lost memories and with a touch of a smartphone screen, you chart a course round desert islands and icy oceans. Introducing Sea Hero Quest, a mobile game created to change the future of dementia research. The game anonymously records the player's sense of direction and navigational ability. One clear picture, published in the journal Current Biology, was that men were better at navigating than women. "So countries where there is high equality between men and women, the difference between men and women is very small on our spatial navigation test. "But when there's high inequality the difference between men and women is much bigger. And that suggests the culture people are living in has an effect on their cognitive abilities." Sea Hero Quest has produced a raft of other findings. The popularity of the game has turned it into the world's biggest dementia research experiment. Being lost or disoriented is one of the first signs of the disease. The next step in the research is to see if catching sudden declines in navigational ability could be used to test for dementia. Tim Parry, the director of Alzheimer's Research UK, said: "The data from Sea Hero Quest is providing an unparalleled benchmark for how human navigation varies and changes across age, location and other factors. "This really is only the beginning of what we might learn about navigation from this powerful analysis." This project was funded by Deutsche Telekom and the game was designed by Glitchers. 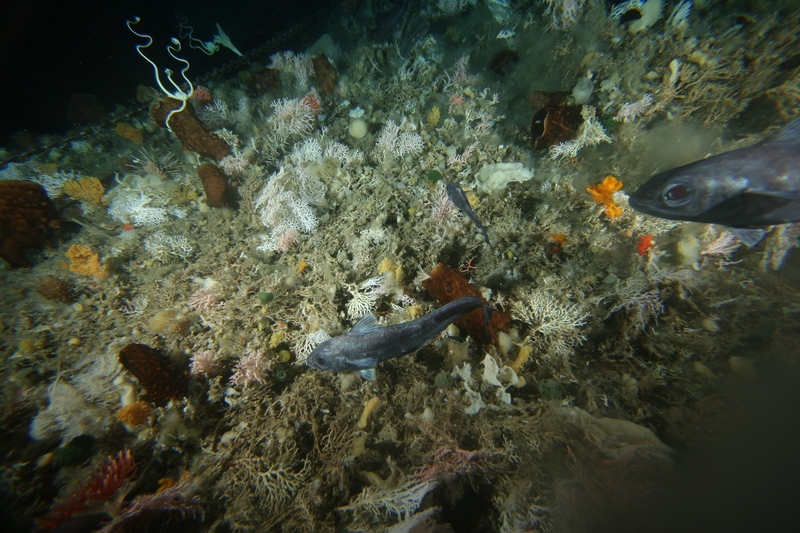 In contrast to common perceptions, Antarctic seafloor communities are highly diverse. 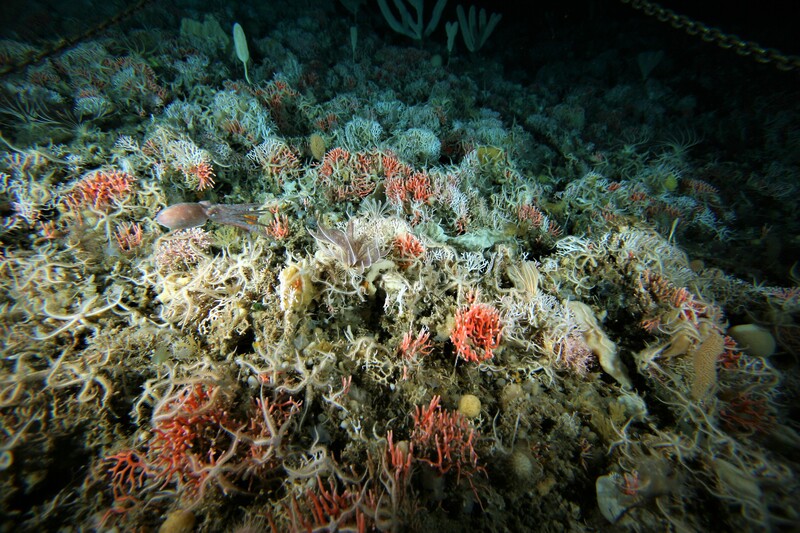 This image shows a deep East Antarctic reef with plenty of corals, sponges and brittlestars. What sort of life do you associate with Antarctica? 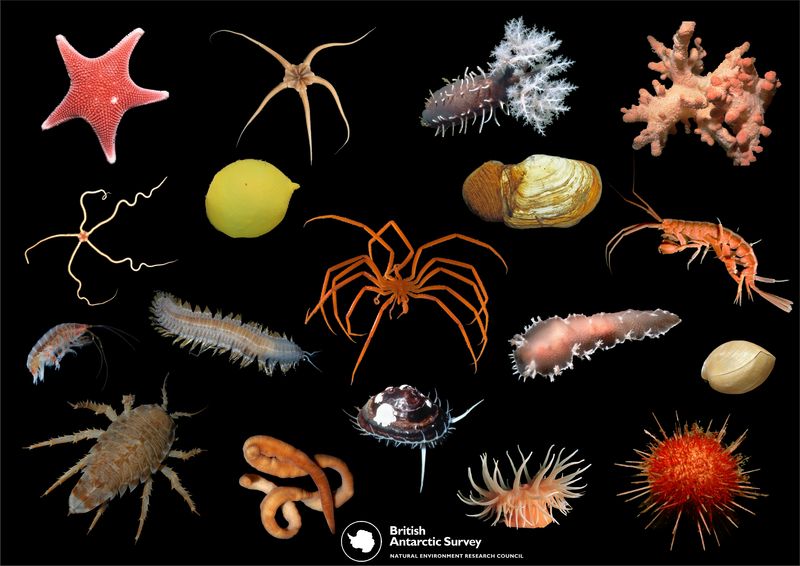 Actually, life in Antarctic waters is much broader than this, and surprisingly diverse. Hidden under the cover of sea-ice for most of the year, and living in cold water near the seafloor, are thousands of unique and colourful species. The footage was recorded on a camera attached to a Remotely Operated Vehicle (ROV) deployed by Australian Antarctic Division scientists under the sea ice at O’Brien Bay, near Casey research station in East Antarctica. The Casey Station, commonly called Casey, is one of three permanent bases and research outposts in Antarctica managed by the Australian Antarctic Division (AAD). 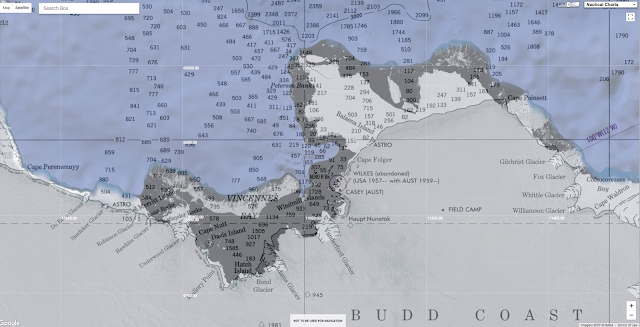 The ocean surrounding the Antarctic continent is an unusual place. Here, water temperatures reach below freezing-point, and the ocean is covered in ice for most of the year. While commonly known for its massive icebergs and iconic penguins, Antarctica’s best-kept secret lies on the seafloor far below the ocean surface. In this remote and isolated environment, a unique and diverse community of animals has evolved, half of which aren’t found anywhere else on the planet. 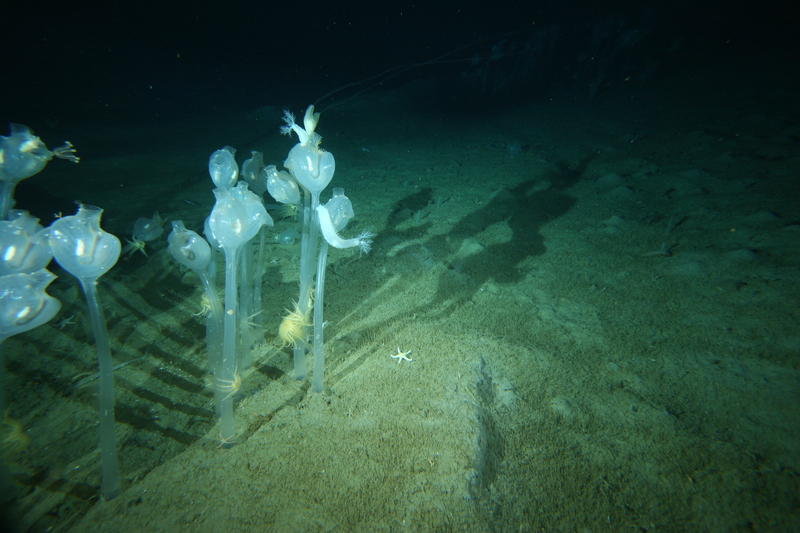 These solitary sea squirts stand up to half a metre tall at 220m depth in the dark, cold waters of East-Antarctica. Images such as this one were taken with cameras towed behind the Australian Icebreaker Aurora Australis. Colourful corals and sponges cover the seafloor, where rocks provide hard substrate for attachment. These creatures filter the water for microscopic algae that sink from the ocean surface during the highly productive summer season between December and March. Biodiversity is a term that describes the variety of all life forms on Earth. The unprecedented rate of biodiversity loss is one of the biggest challenges of our time. And despite its remoteness, Antarctica’s biodiversity is not protected from human impact through climate change, pollution and fisheries. Although scientists have broadly known about Antarctica’s unique marine biodiversity for some time, we still lack knowledge of where each species lives and where important hotspots of biodiversity are located. This is an issue because it hinders us from understanding how the ecosystem functions – and makes it hard to assess potential threats. Why don’t we know more about the distribution of Antarctic marine species? Primarily, because sampling at the seafloor a few thousand metres below the surface is difficult and expensive, and the Antarctic continental shelf is vast and remote. It usually takes the Australian Icebreaker Aurora Australis ten days to reach the icy continent. To make the most of the sparse and patchy biological data that we do have, in our research we take advantage of the fact that species usually have a set of preferred environmental conditions. We use the species’ relationship with their environment to build statistical models that predict where species are most likely to occur. This allows us to map their distribution in places where we have no biological samples and only environmental data. Critically, until now important environmental factors that influence the distribution of seafloor species have been missing. The science behind linking food-particles from the ocean surface to the biodiversity of Antarctic seafloor fauna. Satellites (1) can detect the amount of algae at the ocean-surface. Algae-production is particularly high in ice-free areas (2) compared to under the sea-ice (3). Algae sink from the surface (4) and reach the seafloor. Where ocean-currents are high (5), many corals feed from the suspended particles. In areas with slow currents (6), particles settle onto the seafloor and feed deposit-feeding animals such as seacucumbers. Antarctica is one of the few regions where the total biomass of seafloor animals is likely to increase in the future. 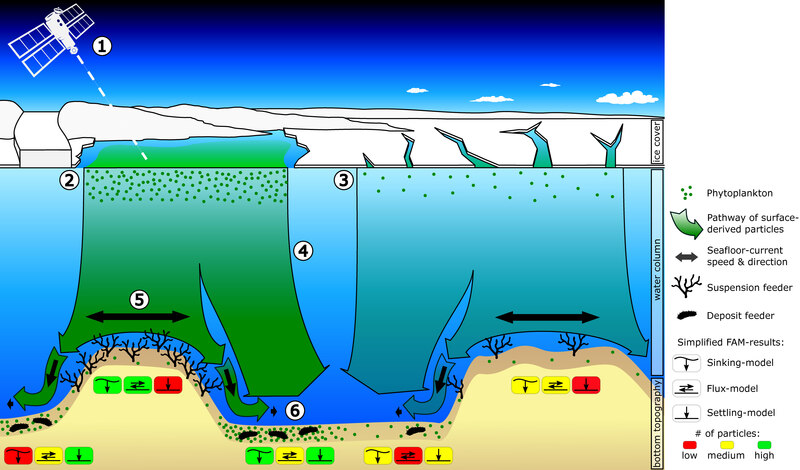 Retreating ice-shelves increase the amount of suitable habitat available and allow more food to reach the seafloor. It is a bright morning in the eastern Mediterranean, and a small robotic watercraft operated by Greenpeace, an environmental group, is quietly approaching two fishing boats about 160 miles north of Egypt’s coast. Unseen by the boats’ captains and crew, the bobbing drone takes a few pictures, and its on-board image-processing systems swiftly determine that illegal drift nets have been deployed. The fishermen hope to catch endangered bluefin tuna, but such nets can also ensnare dolphins and sea turtles. The drone fires off a message via satellite and continues to shadow the fishing boats from a distance. Five hours later a hastily dispatched cutter arrives, and officers from Egypt’s coast guard seize both boats and arrest their crews. The drone, meanwhile, dips beneath the surface and continues on its monitoring mission. That, at least, is how things could play out in the early 2030s, if proponents of aquatic drones have their way. As the cost of building and operating such vehicles drops, satellite communications systems provide cheaper and faster connectivity, and machine intelligence improves, drones could provide a powerful means of policing illegal activities that take place, unseen, at sea. Powered by wave action, wind power or solar panels, drones could operate for months or even years at a time, scanning large areas in swarms, monitoring environmental conditions and alerting human overseers when something looks amiss. If drones ruled the waves, fisheries would be more sustainable, pollution would be reduced and human trafficking would be harder to get away with. Even if drones can monitor only a small fraction of the ocean’s surface, their presence could be a powerful deterrent. Fishing is just one area where aquatic drones could spot illegal activity. Today around one-fifth of the annual global catch, worth around $23.5bn, is taken illegally, as fishermen exceed quotas, fish in protected areas or use banned methods such as drift nets or dynamite fishing. The dumping of pollutants could be detected, too. By one estimate, vessels intentionally discharge some 276,000 tonnes of oily gunk into the sea each year, nearly half as much as the Deepwater Horizon disaster spewed into the Gulf of Mexico. Drones could use sensors to sample seawater for traces of improperly dumped fuel sludge, solvents and dirty engine oil, or deploy small, flying cameras to take aerial pictures of tell-tale oil slicks. In coastal waters, flying “sniffer” drones operated by port authorities could fly through the exhaust plumes of large ships to check that they are not exceeding emissions limits. Monitoring air pollution from ships using helicopters and UAVsProject Sense introduces a cost efficient and reliable system for monitoring emissions from ships during cruise using unmanned aerial vehicles (UAV) and helicopters in combination with AIS data and advanced data analysis to sample plumes and detect non-compliant behaviour enabling effective enforcement of applicable emission regulations. Drones could also tackle human trafficking, and the use of forced labour at sea, by spotting suspicious activity, such as boats that stay in a particular area but avoid visiting port for months at a time. Tens of thousands of men from Cambodia, Indonesia, Myanmar, the Philippines, Thailand and Vietnam are thought to have been enslaved on fishing vessels that, to prevent escapes, offload their catch and take on supplies from other vessels far out at sea. Enthusiasm for drone-based monitoring is not driven simply by improvements in drone technology. It is also a consequence of the high cost of traditional means of enforcement. Operating a US Coast Guard cutter, for example, typically costs $1,500-3,000 per hour. And its visibility means nabbing offenders in the act is akin “to catching lightning in a bottle”, says Mark Young, a former head of enforcement for the Pacific Ocean. Manned aircraft cost more than $10,000 per flight hour. With today’s technology, says Mr Young, not even America can afford to fully patrol its “exclusive economic zone”, the waters within 200 miles of its shores. Even less attention is paid to the nearly two-thirds of the ocean that is beyond any country’s jurisdiction. Satellites are already helping in some areas. 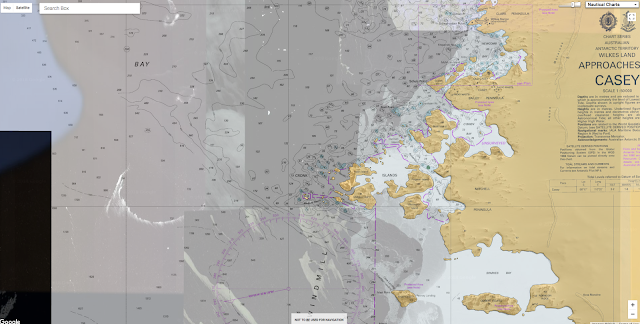 Requiring ships to carry transponders that report their position, for example, can reveal vessels that suspiciously avoid ports or dawdle in marine protected areas. But not all ships are required to carry transponders, and some captains switch them off. Roughly half of fishing boats off the east and west coasts of Africa do not transmit their location, Greenpeace says. These “dark fleet” vessels can be spotted in satellite pictures, but monitoring them in this way is problematic too. For one thing, a high-resolution photograph of a square region, 10km (six miles) wide, costs about $2,700. SkyTruth, an environmental watchdog based in West Virginia, receives some imagery free from satellite providers. But shots must be requested and scheduled hours in advance. On the last 25 occasions when he has made an educated guess as to where a suspect boat would be for a photo 12 hours later, SkyTruth’s most senior analyst, Bjorn Bergman, was right half the time. Wave Gliders provide an essential link to connect seafloor to space nearly anywhere in the ocean. See how the Wave Glider relays information from underwater back to shore. One firm betting that sea drones are the way forward is Liquid Robotics, a subsidiary of Boeing, an aerospace giant. Its autonomous, surfboard-sized Wave Gliders use underwater “wings” to harvest energy from the up-and-down motion of waves to travel at one to three knots, or a bit faster using an auxiliary propeller powered by solar panels. The drones have operated for up to a year at a time and withstood hurricanes. Onboard systems collect data on submarines, fishing boats and pollution, firing off alerts via satellite to authorities. Being small and silent, Wave Gliders are unlikely to be spotted by seafarers up to no good, says Gary Gysin, the firm’s boss. Liquid Robotics has sold more than 400 Wave Gliders, which cost $200,000 or more depending on which sensors are fitted, to outfits including the Australian and American navies and Japan’s coast guard. Future models will serve as platforms for aerial drones. The firm sees an emerging “internet of things for the ocean” that reports not just on lawlessness, but also on the health of marine life, water temperatures and currents, to help ships plot more fuel-efficient routes. 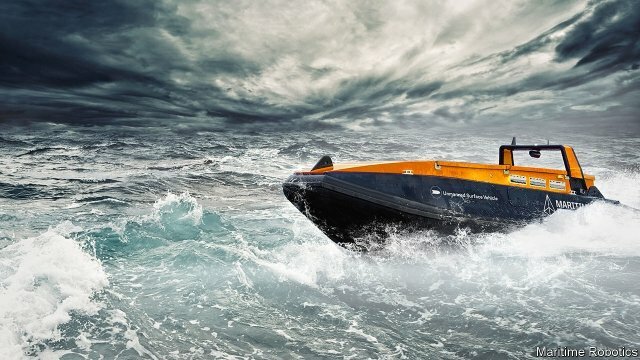 Maritime Robotics, a Norwegian firm, sells a much faster surface drone that zips along at a blistering 60 knots under diesel power. Called Mariner, it can switch to battery propulsion to “sneak in” for a closer look at a suspect vessel, says Vegard Evjen Hovstein, the firm’s boss. 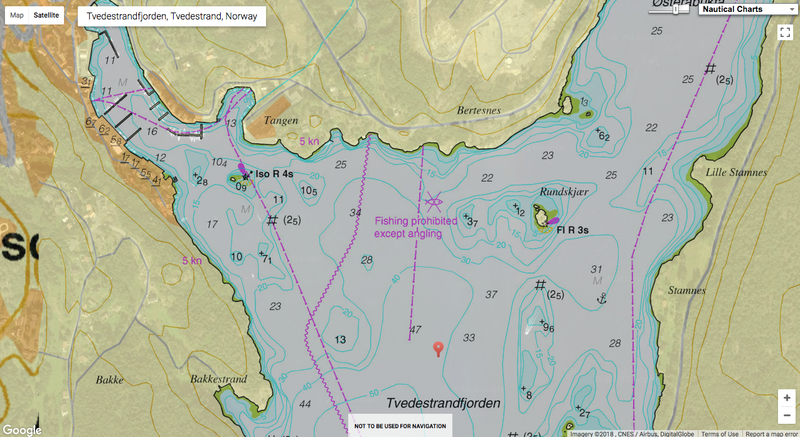 ASV Global (ASV), in partnership with Sonardyne International Ltd., the National Oceanography Centre (NOC) and SeeByte, have successfully delivered a long endurance, multi-vehicle, autonomous survey solution. ASV Global, the British maker of a similarly fast surface drone, expects sales this year to top $22m, up from $15m in 2017. Dan Hook, ASV’s head of business development, imagines selling models by 2030 that can dive underwater and stick up a camera and directional microphone on “a little snorkelling mast” to determine what a boat is up to. Efforts to combat lawlessness at sea are also expected to benefit from spending on aquatic drones by navies. Pradeep Chauhan, a former head of intelligence for India’s navy, reckons that in addition to their military duties, naval drones will perform the “spin-off” mission of detecting lawbreaking at sea. Nevin Carr of Leidos, a firm based in Virginia that designs submarine-hunting surface drones for the US Navy, in which he served as a rear admiral, says movement-analysis algorithms are being devised to determine what civilian vessels are doing. That could include identifying ships that are smuggling drugs, weapons or humans, says Jayanath Colombage, a former commander of Sri Lanka’s navy during its fight against the Tamil Tigers, who partly funded their insurgency with such smuggling until being defeated in 2009. Within ten years Greenpeace expects to have a fleet of aerial, surface and even underwater drones, with the latter seeking, among other things, signs of unlawful seabed mining, says John Murphy, the outfit’s head of drones. Sea drones are still expensive, but costs will continue to drop because they share so many components with smartphones. Fees for satellite-data services will also plummet, experts reckon, as new constellations of broadband satellites are launched. 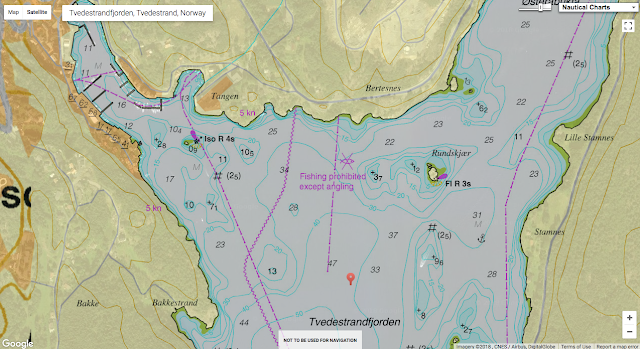 And, says Bjarne Schultz of Norway’s Directorate of Fisheries, analysis of data on individual skippers’ behaviour, and the migratory patterns and market prices of fish, will allow drones to be sent to the areas where illegal activity is most likely to occur. More broadly, both coast guards and environmental groups believe that maritime drones will make the dispatching of manned patrols far more targeted and cost-effective. When it comes to preventing lawlessness at sea, swimming robots could be about to make a big splash. It was a tale of two storms. The first consisted of the rain and thunder forecast for Bournemouth by the BBC weather app on the Saturday spring bank holiday. The second came when the first failed to materialise and a tourism manager in the town complained that visitors who stayed away could have come after all and enjoyed sunshine and blue skies. This opportunity to rage at inaccurate forecasting, bash the BBC and highlight the grievances of small businesses did not go to waste. For the Sun, it was a “blunderstorm”. The Mail gave voice to furious social media users whose weekend had been ruined by “crap forecasting” and “total incompetence”. The Spectator even managed to use the row to take pot shots at climate-change predictions. So, just another non-storm in a media teacup? Perhaps, yet the story highlights important questions about how technology is transforming both weather forecasting and our relationship with it. Is our ability to predict temperature, precipitation and wind speed improving? If so, how come forecasts can vary so widely depending on which smartphone apps we use? How long have human meteorologists got before supercomputers and artificial intelligence make them redundant? And when can we expect 100% accurate forecasts? The foundation of modern weather forecasting involves gathering huge amounts of data on the state of the atmosphere and Earth’s surface, such as temperature, humidity and wind conditions. Gaps in the data are filled by extrapolating from available observations and past forecasts. Forecast models consisting of sets of equations governing physical and chemical processes use this as a starting point to calculate future conditions. The impact of weather forecasting on human activities is hard to overstate. A 2011 study by the economist Jeffrey Lazo found that US GDP alone could vary by as much as $485bn (£366bn), depending on the weather. No wonder huge sums have been invested in improving predictive capabilities. The number of weather observations has risen dramatically, along with their quality. The Met Office, for example, is integrating wind-speed data gathered from transponders carried by large aircraft for navigation purposes into its models. Nasa’s GOES-16 satellite, declared operational in December, scans the Earth much more quickly and in greater resolution than previous satellites. In February, the UK completed a £10m upgrade of its rainfall radar network, allowing it to deliver five times more data than before. All this data is fed into “petaflop” supercomputers capable of doing a thousand trillion calculations per second. These are needed because of the complexity of forecast models that approximate atmospheric processes. These models have become ever more complex as the science has advanced. The extra number-crunching firepower also enables “ensemble forecasting”, whereby forecast models are run multiple times using slightly different starting data to explore the probabilities of various outcomes. This combination of more data, bigger computers and better algorithms has delivered impressive results. A study published in Nature in 2015 found the ability of meteorologists to predict atmospheric pressures three to 10 days ahead had been improving at a rate of about one day per decade since 1981. The Met Office says its four-day air pressure forecasts are now almost as accurate as its one-day forecasts were three decades ago. The digital revolution has transformed how we get and use weather forecasts. Smartphone apps offer highly localised predictions and wider time frames – from what will happen in the next hour to a fortnight’s time. There are 8,000 apps with the word “weather” in their title for Android phones and 2,400 for iPhone users. With so much choice, how can non-experts work out which are most reliable? Measuring forecasting accuracy is far from simple. What is most important – temperature, rain or wind conditions? Is average overall error most useful, or how often a prediction meets reality? “There are many, many ways to measure forecasting accuracy,” says Eric Floehr, founder of ForecastWatch, a US company that analyses the performance of weather providers. A ForecastWatch report published last year compared the accuracy of six leading global forecast providers – AccuWeather, the Weather Channel, Weather Underground, Foreca, Intellicast and Dark Sky. The study covered one- to five-day forecasts for 1,145 locations, including 29 in the UK, during 2016. AccuWeather’s predictions were best for temperature averages and highs, probability of precipitation and wind speed. The Weather Channel and Weather Underground came top for low temperature predictions. Dark Sky came last in all these categories. In the UK, the BBC app has the most users, followed by the Met Office’s. In February, the BBC switched from using the Met Office to generate its app forecasts to MeteoGroup, a forecasting company owned by a US private equity group, on grounds, it says, of service quality and value for money. Floehr provided the Observer with separate data on 12 forecasters covering 29 UK locations during 2017. In a composite measure of accuracy, the Weather Channel and Weather Underground came top, AccuWeather fifth, MeteoGroup (the BBC’s new provider) sixth and the BBC ninth (based on Met Office forecasts). On the correct prediction of precipitation, MeteoGroup came fourth overall and the BBC 10th of the 12. Most regular weather app users will be familiar with the dilemma of trying to decide which to believe when predictions disagree. Given the improved accuracy of forecasting in recent years, why is there still such wide variation between different providers? Some forecasters can access more observations than others. And they use different algorithms based on different forecast models with different levels of detail. Some apps simply churn out computer models’ predictions, others employ meteorologists to supervise and correct these, especially in unusual or extreme weather. Which weather forecast should you believe? “We have unique relationships with governments and companies that allow us to obtain the most relevant, real-time data, and use over 125 global, regional, national and local forecast models, says Jonathan Porter, a vice president at AccuWeather. “We’re constantly integrating new datasets and enhancing our algorithms. Even if the raw data coming out of algorithms used by different forecasters were identical, there could still be differences by the time their reached our screens. “One big difference between apps is what information they choose to show,” says Derrick Ryall, head of public weather service at the Met Office. “Some choose to simplify things while others put in a lot detail. Another source of difference between apps is that, contrary to what some might expect, accuracy is not the sole consideration. In his 2012 book The Signal and the Noise, US statistician Nate Silver highlighted how plotting forecasters’ rain predictions against actual weather showed some consistently erred on the pessimistic side, especially at lower and higher probabilities of rain. “As a consumer you are going to be a lot more upset with a forecaster if you get rained on and forget your umbrella, than if you don’t have to use the umbrella you took,” says Floehr. Some leading forecasters are now moving away from this approach. Peter Neilley, a senior vice president at the Weather Company says it stopped having a “wet bias” around three years ago. “Rather than trying to make judgments ubiquitously about what’s important to people, we pay more attention to the probability of precipitation so people can make their own judgments,” he says. The BBC app has faced widespread accusations of pessimism. It now includes hourly percentage chances of rain, which have caused confusion. “If you try to compare the weather symbol with just the probability of rain you won’t always see a direct correlation because other elements have an influence on that symbol,” said Nikki Berry, a senior meteorologist at MeteoGroup. The BBC app sometimes displays a daily rain icon even when it predicts a less than 50% chance of rain during just one hour of that day. “We use the most significant or impactful weather on that day so people aren’t caught out,” says Berry. She adds that those making important decisions based on forecasts should look beyond weather icons for more detail on the BBC website weather page. As in many other spheres, advanced computers are increasingly muscling in on roles previously done by meteorologists. As faster processors take over the grunt work, forecasters are shifting towards the more complex aspects of their profession. “There is very little human touch to the forecasts people receive on their smartphones,” says Floehr. “Meteorologists are increasingly focused on communicating forecasts, and helping people turn them into actionable intelligence. However, those for whom the joy of complaining about the weather is only surpassed by a good moan about forecasters – whether in the media or not – can rest assured. Science tells us there is no such thing as a perfect weather forecast. 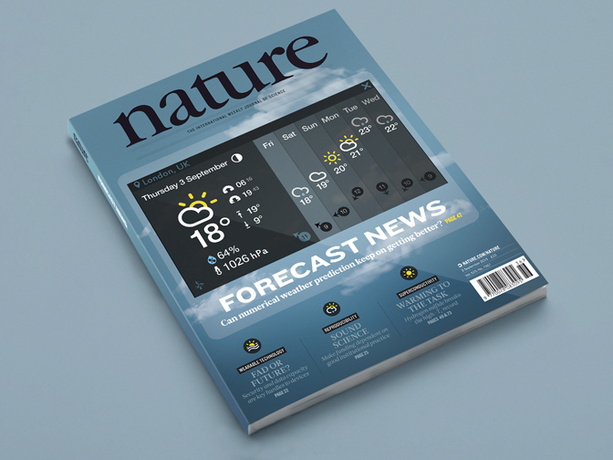 “To know everything about the weather you would need to model every single particle in the atmosphere and all interactions between them,” says Neilley. “That isn’t even theoretically possible, because the computer doing the modelling would generate heat and become part of the system, and then need modelling. Putting a thermometer in the air changes conditions a tiny bit. Satellites have been key in driving better predictions one day and more ahead, but are less useful over shorter time scales. Barometers provide air pressure readings that can help signal imminent changes. Digital barometers have been included in some smartphones since 2011 to assist location tracking, and around 1bn smartphones can now measure air pressure. Prof Cliff Mass at the University of Washington has shown smartphone data can help improve the accuracy of short-term air pressure and rain forecasts. It could also help to predict wind changes. “Cellphone data could help us better predict things like thunderstorm initiation, and have a big impact in places where we have less data than we’d like,” says Mass, who is also using machine learning to improve the quality of smartphone air-pressure data. He is working with the Weather Company, which collects 250m pressure readings via its Weather Channel app. Peter Neilley of the Weather Company said this data should be incorporated into its forecasts during 2019. Other forecasters, including Dark Sky, have also been experimenting with using smartphone air-pressure data. The stills are transformed into cinemagraphs - a hybrid between photo and video - an infinite loop that makes a single moment last forever.